Tagging, or mentioning others on Google+, can be a great way to get someone else’s attention and bring that person into a conversation. Keep in mind, however, that some people are already getting a lot of notifications, and your tag may be just one more notification that they must respond to. Because many of their friends may be doing the same thing, tagging someone can become annoying if there is no purpose behind the tag. 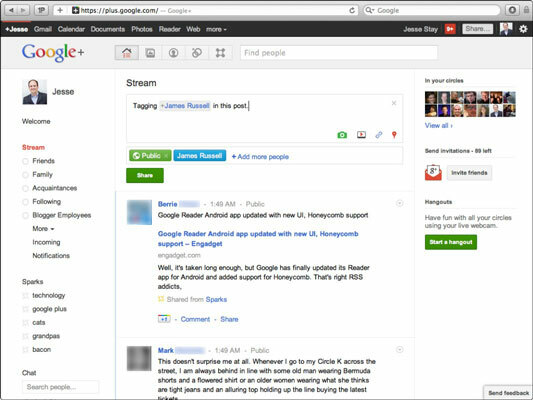 Be selective in your use of tagging on Google+. When tagging an individual in a post, do so tactfully. Is the item in which you’re tagging them actually related to them or something they’re really interested in? If a person likes Android and you’re tagging them in an article related to the iPhone, they’re really not going to be interested in your tag. Think about things individuals are truly interested in and items they may want to discuss. Don’t tag just to tag. This is important. Just tagging people to get their attention is spam, plain and simple. Tagging them for no reason other than to get their attention is just the same as sending them an e-mail with that item you are sharing, because each post or comment you tag an individual sends them a notification (and sometimes even goes to their e-mail account). They are likely to respond negatively or block you as a result. Avoid excessive tagging. If this sounds a lot like the previous bullet, it should — it’s that critical. If you tag people too often (even if it’s something you think they’ll like), they are likely to notice, uncircle you, or even block you. Keep in mind that some people have their notifications sent to their e-mail inbox, so every post you tag them in is filling their inbox. Only tag others on occasion, and only when it truly makes sense to do so. If you don’t know the person, think twice before tagging them unless you’re tagging something he or she is really involved with. If you don’t know a person you’re tagging and that person doesn’t know you, he or she may wonder why you’re tagging in the first place. A good rule of thumb is to tag other people only when they’re in an article, a post, or an image in which you’re tagging them. Then you can tag them to let them know about it. If they’re not in the item you’re tagging them in, it’s usually considered polite not to tag them.